News Photo by Jonny Zawacki Alpena Midfielder Deven Saranen (3) battles with Tawas defender Christian Shaw (29) for a loose ball during the first half of a boys soccer game on Tuesday at Wildcat Stadium. 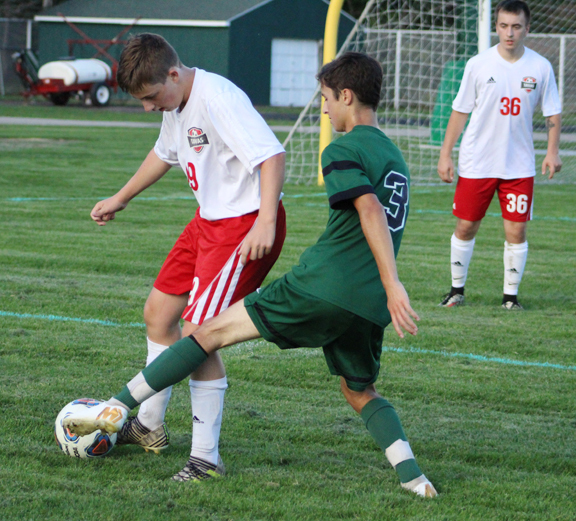 Since dropping the first two games of the season, everything has been going good for the Alpena High boys soccer team. 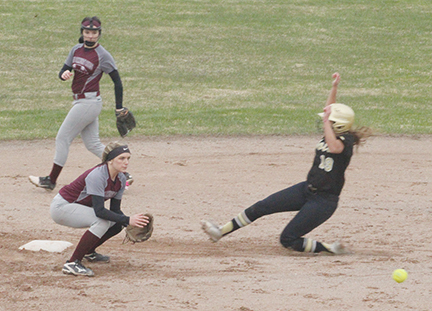 The Wildcats picked up their fifth consecutive victory on Tuesday in a dominant 8-1 victory over Tawas at Wildcat Stadium. 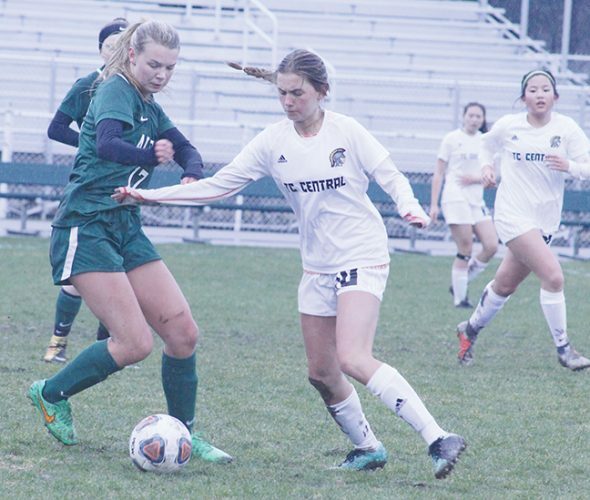 The only thing that Alpena could have asked for was a fifth straight shutout, but the Wildcats continued attacking and applying pressure on their opponent much like they’ve done during their current winning streak. 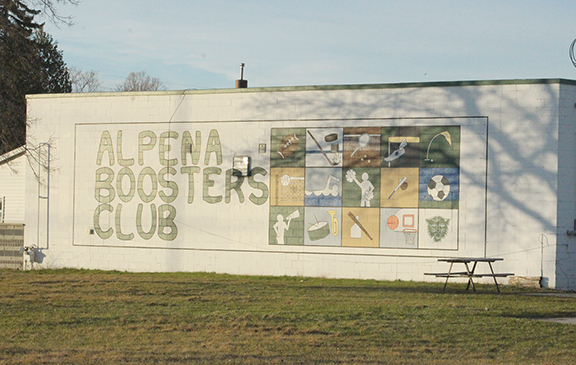 During that stretch, Alpena (5-2) has averaged nearly six goals per contest. The Wildcats won again Tuesday due to their ability to stay on the attack all game long. Senior Aidan Day and sophomore Grant Botha each recorded a hat trick in the game, netting three goals each while the other two goals came off of the legs of Deven Saranen and Caleb Eaton. Alpena wasted little time putting points on the board as Day found the back of the night twice and 22 seconds after Day’s second goal, Saranen gave the Wildcats a three goal lead within the first ten minutes of the game. Tawas cut into the lead with 24:54 left in the first half as Joshua Maynard scored a goal on a beauty of a shot that sailed over the head of Wildcat keeper Wenton Harrison. Alpena’s keeper had little chance on what was a near perfect shot from way out. The goal only seemed to fire up the Wildcats even more as they continued to dominate the Braves and keep the ball in Tawas territory the remainder of the half. Botha scored his first of three goals with 9:15 left in the opening half, ripping a shot right at Tawas keeper Samuel Bacarella that was too hot for him to handle as it went through his hands and into the back of the net. Alpena added its final goal of the half when Day delivered a perfect pass to Eaton who scored an easy goal to give the Wildcats a 5-1 lead heading into the break. The second half was much of the same as Alpena refused to let up. Botha scored his second goal of the night midway through the half, Day got his third goal on a header and Botha completed his hat trick for the eight and final goal with 4:47 to play on a ball that went off the crossbar and just crossed the goal line. The Wildcats finished the game outshooting Tawas 25-3. 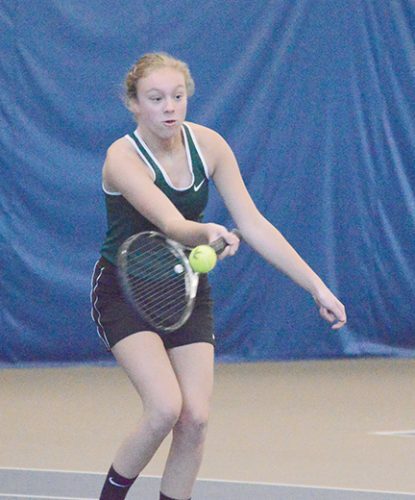 With confidence brewing, Alpena will hope its stellar play continues when it opens up Big North Conference play tomorrow at Traverse City Central.